With Christmas out of the way and after a news story broke of President Trump regifting a present his son had bought him (by giving it back to his son as a present ), a debate occurred on this issue on a UK breakfast TV show this morning. I'm conflicted on the issue, on the one hand I think I wouldn't have an issue regifting an item (the alternative is I throw it away or it gathers dust), on the other hand I understand those who think it's disingenuous and lacks gratefulness. From an exological perspective alone, def yes. If it's in good condition and useful, but would've end up in trash,, then I don't see why. This gifts culture went waaay too far and it might be a good idea to have less of it. Usually i do not. But i received so many bottles of wine that I just gave one to my parents. The one with the ugliest label of course, it did not fit my interior! I always re-gift wine and beer, I don’t drink it. The bigger problem is wrapping paper, what a horrible waste. I initially thought it would be quite rude if the gift giver finds out, but nothing should be wasted or sat in a drawer when it could be given to somebody who will appreciate and use it. Money is always the best thing to give for this very reason. I also re-gift alcohol (wine)... i don't use it. oh darling, I only use Vodka. 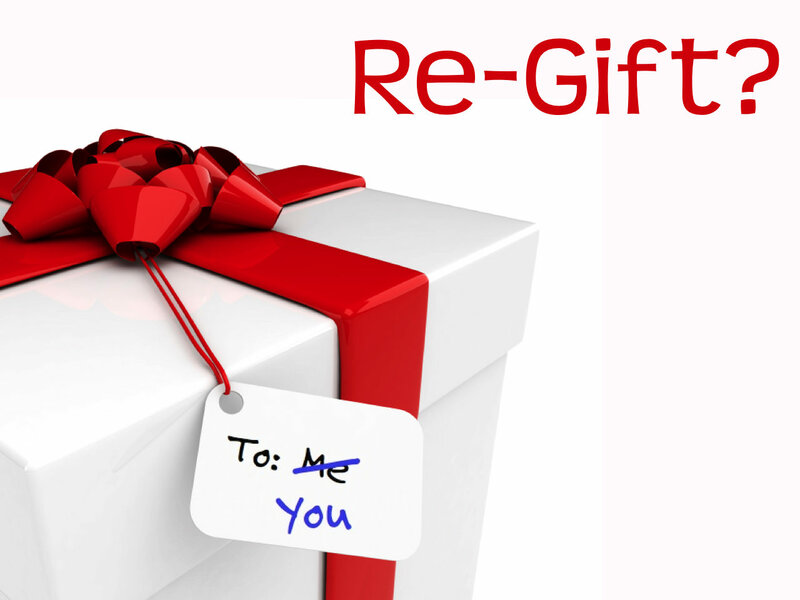 If I do regift something I don't pretend it's a gift from me. I just come forward and say: "Hey I got this, but I don't use it/need it and I think it would be more useful to you, so here!" But usually I get stuff I use. I rarely regift. Same. I always regift wine because I don’t like it. I banned my friends from buying me presents/gifts. If they wanna reward me so much, they can give me a bottle of alcohol or they can take me to a dinner. You do not like wine . Nope, I find the taste unbearable, regardless of type or quality of the wine. And lager, champagne/fizz, beer, cider of any kind. The only alcohol I like is certain spirits - gin, dark rum, vodka.